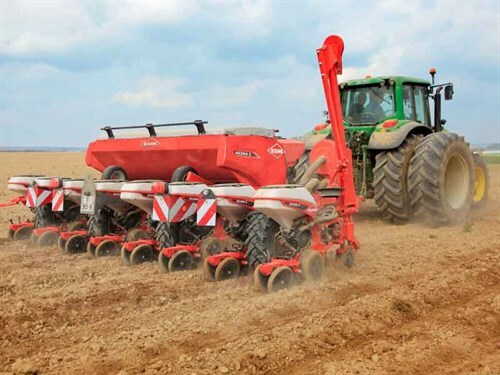 This trailed version offers the ability to sow eight rows using a medium-powered tractor of around 100 horsepower, as well as carrying 1500 litres of fertiliser. Its trailed function, equipped with the patented "Kuhn Stabidrive" solution, guarantees exceptional stability during road transport and headland turns. The "KUHN Stabidrive" helps to keep the seed drill aligned when sowing on undulating and hilly terrain. The frame is ideal for farmers and contractors who are used to loading the seed drill at the farm. In addition to its three metre width during transport, the Maxima 3 TRR 8-row has road certification allowing it to travel fully-loaded. Easy access to the hoppers via the broad access platform makes it easy to fill fertiliser and micro-granular hoppers. Four load-bearing wheels are fitted as standard to prevent soil compaction and provide improved terrain following during sowing. The two central wheels also provide the mechanical drive to the sowing drill and fertilisation components. With its simple adjustment and sturdy construction, the new Maxima 3 drill is a well-balanced machine that provides a high work rate with sowing speeds of 10kph.